Traditionally, there have only been two main types of contact lenses: soft contact lenses or rigid gas permeable (hard) contact lenses. As with most choices, there are some definite pros and cons to both. Soft contact lenses have a ton of benefits and great qualities, compared to hard contact lenses , such as increased comfort and higher oxygen permeability. However, sometimes their optics are not as good as a rigid gas permeable, or hard contact lens. 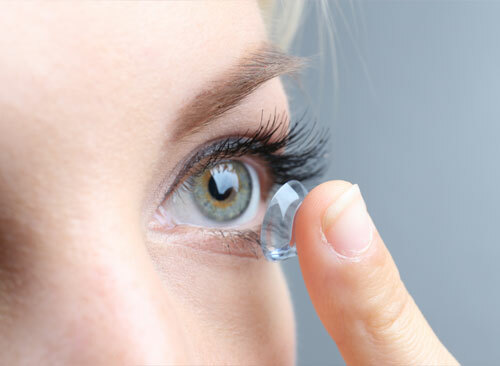 Hard contact lenses, however, usually aren't as comfortable as soft lenses and can fall out more easily! Because of this, contact lenses can be a little bit of give and take, i.e. trying to balance the best optics while giving you optimal comfort. Wouldn't it be great if we could mesh the benefits of soft and hard contact lenses together?! Great news, now WE CAN! Hybrid contact lenses do just that. The center portion of the lens is a rigid contact lens material, meaning you will get the optics of a hard contact lens. This can be especially great if you have astigmatism, keratoconus or wear reading glasses, or maybe told you weren't a contact lens candidate. The hard lens is surrounded by a soft skirt, giving the comfort and ease of wear of soft contact lenses! Truly, it is the best of both worlds. These lenses can also be used in patients with corneal diseases, such as keratoconus, pellucid marginal degeneration, or a history of RK surgery. Sound too good to be true?! Come see for yourself and schedule an appointment with Eye Care Center. Dr. Dobson and Dr. Zike can evaluate if you would be a good candidate for a hybrid lens, and help answer any other questions you may have about the benefits of switching or trying a hybrid lens. Eye Care Center's team has been off to a great and busy summer! However, it's time to get back into the groove and celebrate our national eye holidays once again. June is National Cataract Awareness Month. Did you know cataracts are one of the leading causes of blindness in the United States!? If managed appropriately, cataracts are very treatable, in fact some patients reports they have never seen so well, following cataract surgery. Cataracts are something we all get to look forward to experiencing. The natural lens focuses light that comes into the eye, and focuses it on the back of the eye, the retina. When we are born, the natural lens inside our eye is perfectly clear. Over time, the natural lens inside of our eyes becomes cloudy, this is a cataract. As this cloudiness increases, vision is altered. Some early signs of cataracts include glare at night, and decreased contrast. Eventually, visual acuity will decrease. Cataracts are evaluted at your annual eye exam. Generally, when you feel like your daily activites are affected because of the changes in your vision, is when we more seriously consider cataract surgery. During cataract surgery, the cloudy lens is removed and an intraocular lens implant, or IOL, replaces it. There are several different types of IOLs. Your eye doctor will help determine, based on your daily activities and life, what lens implant may be best for you. Cataracts can become more difficult to remove, if they advance to a very dense stage. This is one reason why annual eye exams are so important. At Eye Care Center in College Station, we will help identify the stage of your cataracts and help create a plan best suited for your needs. Dr. Dobson and Dr. Zike will also likely talk to you about UV protection. UV light can advance cataracts, so they often recommend UV protection to help slow down the progression of cataracts. If you have heard you have cataracts in the past, or have noticed some vision changes, schedule your appointment at Eye Care Center today!